I say twins even though they are cousins because where you find one, you will find the other. Their houses are only about 40’ apart. I am showing them the new Chromebook that Diane Vernon donated for them to use for their lessons when the old laptop died it’s final death. 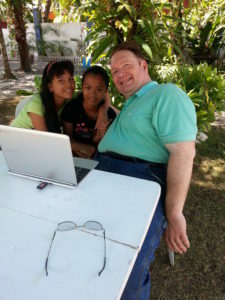 Showing Babeselle and Mimi the new Chromebook for the children’s home. 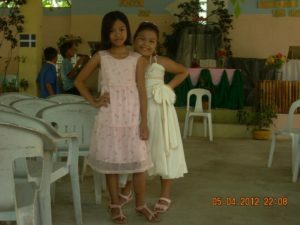 This is Babeselle and Meriam. Babeselle is her nickname of course, and Meriam is known as Mimi, or most often Ate Mimi. 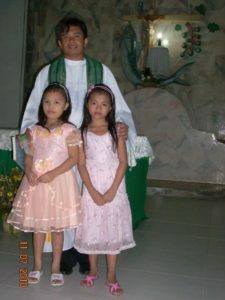 Ate is a honorific used to signify and older sister. So Ate Mimi and Ate Babeselle is a respectful way that the children refer to the two oldest of the children. Babeselle’s mother, Inday, is the lady that does the cooking and runs the children’s home with a little volunteer labor from some extended family members. Babeselle is a little younger than Mimi, but in many things, especially education, is the leader. She has qualified for advance placement classes in school and helps teach the younger ones when they are struggling with their lessons. Mimi is very bashful with strangers and quiet in all circumstances but is very bright and willing to help with lessons. These two have set an outstanding example to the others with their dedication of learning and putting their lessons first. Inday has helped work out a schedule for the children and include scheduled times for play and music. About a year ago I was able to get a guitar for them to learn to play since several had an interest in music. When the internet signal is strong enough there for video chat, occasionally one of them will want to play something for me to show how they are progressing. 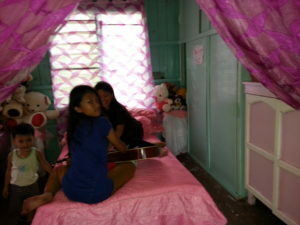 Babeselle and Mimi practicing the guitar. This is the twin bed that Inday and Babeselle share. In the background are many of the stuffed animals that have been sent to the children. A while back a couple of them decided they wanted to practice martial arts. They had seen something on TV that they were trying to imitate. It bore no resemblance to any known style of martial arts, however as we all know, everything on TV is real. It was organized exercise so it hurt nothing. The twins on a street in town. 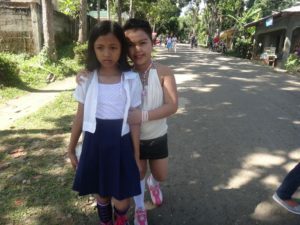 Babeselle and Mimi at the end of school recognition day. 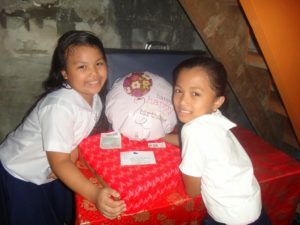 Sharing the happiness of the birthday box for Babeselle.